Marie Lord, described by friends as the classic strong woman behind the successful actor Jack Lord of "Hawaii Five-O," died yesterday at her Kahala home. 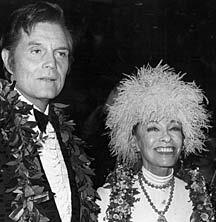 Jack and Marie Lord were at the Hoku Awards on May 3, 1981. Marie Lord and husband Jack, who starred as Steve McGarrett in television's longest running police drama and died in January 1998, lived in the same Kahala condominium since the 1970s. A trustee of her estate declined to provide cause of death. "She was devoted to Jack; there was never anyone or anything who got in Marie's way to care for Jack," said Jimmy MacArthur, who co-starred as Danno in the series, in a telephone interview from the St. Andrew's gold course in Scotland. "She would be up at 3 a.m. to read through dialogue with Jack and get him ready for a day of work on the set. "And when she came to the set, Marie was always well-dressed, very pleasant to everyone. Marie was a nice lady." MacArthur and others for years would take Marie Lord to lunch at the then-Kahala Hilton where she would talk about her deceased husband and the fun times on "Five-O," said MacArthur. Marie Lord was born Marie L. de Narde in St. Louis to French parents. She studied fashion and art in Paris and later moved to New York to pursue a career as a fashion designer. She met Jack Lord in New York, who was a fine arts major at NYU on a football scholarship. Marie soon left her career to support Jack in becoming an actor. Lord called Marie "the bride of my youth who abides me still." Marie Lord would spend hours assisting Jack with administrative tasks that came along with him being a star. Eddie Sherman, a MidWeek columnist who appeared several times on "Hawaii Five-O," called Marie "the rock behind Jack Lord." "He didn't do anything without her," Sherman said. "They were like meat and potatoes, the perfect combination. They were totally devoted to one another." Entertainer Jimmy Borges, who also appeared in several "Five-O" episodes, called Marie Lord "a wonderful, sweet, giving lady" who would regularly thank Borges for his efforts to local charities. Marie Lord, who was in her 90s, requested that there be no funeral services and that in lieu of flowers, donations be made to the Jack and Marie Lord fund that benefits local charities. Donations can be sent to the Hawaii Community Foundation, 1164 Bishop St., Suite 800, Honolulu 96813.